Magic Bullet Blender Buyers Guide. 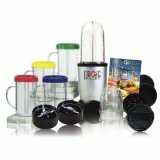 17 piece Magic Bullet Express eliminates the need for a food processor, blender, and a coffee grinder. This machine will chop, whip, blend, grate, mince and more. You can use this to make smoothies and shakes. Parts are dishwasher safe, plus the cups and mugs are microwave and freezer safe. This kit includes recipes, 2 vented lids, 4 mugs, 2 sealed lids, 2 blades, 2 cups, and a power base. 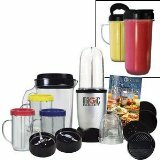 This is a 25 piece Magic Bullet Blender Set that includes 5 colored lip rings, recipe book, 2 flip top lids, 3 party mugs, 2 Bullet-On-The-Go 22 ounce mugs, 2 shaker/steamer tops, 2 stay fresh re-sealable lids, 2 stainless steel flat blades, high-torque power base, 3 pice small pitcher/blender, and one tall cup. Some of the uses include making milkshakes, smoothies, pancake batter, and frozen drinks. 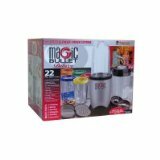 This is a 22 Magic Bullet Set. It will replace your blender, food processor, coffee grinder, and juicer. Plus, it takes up a very small amount of space on your counter, in fact, it only takes the space of a coffee mug. It only takes seconds to chop onions, mince garlic, blend spaghetti suace, salsa, soup, smoothies, shakes, and much more. Do you like Frozen Cocktails? Well, it can make those too! This Bullet Express System includes a bonus Juicer Express. 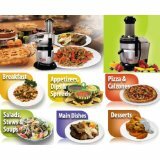 You can use this machine for a vast variety of kitchen duties. Basically, you can make a family meal that will be ready to Heat or Eat in only 8 minutes. Great for someone with a family and who works and has little time to spend preparing meals. Plus, if you want suggestions, you are supplied with a 101 Recipe Cookbook and an additional cookbook. 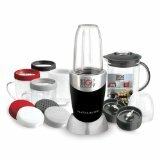 This is the Magic Bullet Blender Express Model Number 7712. 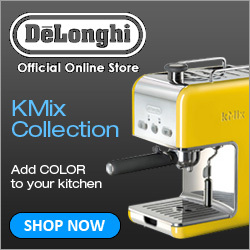 Very simple to operate, and yet it can replace several machines in your kitchen. Your blender, coffee grinder, and food processor. Includes microwave and freezer safef mugs and cups, 2 blades, power base, 2 shaker/steamer tops, 2 lids, and also a recipe book. Parts are all dishwasher safe. Unit is covered by a one year limited warranty. 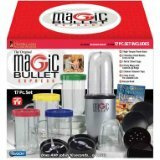 This is a 20 piece Magic Bullet Platinum Pro Set Model Number 7921. Items included along with the Magic Bullet are 2 blades, 2 cups & 4 mugs, blender attachment, 2 lids, 2 shaker/steamer tops, recipes, and one year limited warranty.